In our Batman - Arkham Knight guide we show you first tips and tricks for newcomers. That you survive the first hours of play without prejudice and make Batman into a true fighting machine. But not only the Dark Knight benefited from our advice. Even the Batmobile, collectibles and Schleich deposits can be found here. Follow the links below you come to the individual topics. Do you have tips ready? Then we wrote in the comments! Here first, you should invest in the fight improvements in critical strike. This caused double damage at your goals in time sequences of beats. For this you have to simply during a hit run the next blow. After some time the light go out of hand. This drives the combo meter in height, making your opponents into kindling. Of course you use is a good offense nothing if you are not well protected. Points invested in the improvement of your Batsuits. Select the first two levels of impact and defense sphere, as they require only a few Waynetech Points. This make the best after you got your new Batsuit. On the same roof you can complete ER training, the required points can easily get. With the so-called Waynetech improvement points you upgraded to all abilities, gadgets and items of equipment of Batman. Therefore it is worthwhile early to collect many of these points in the game. This is best achieved through the ER-challenges that are spread all over the game world. Already on the first island you will find sufficient points to earn the first stages of most abilities. Did you get your new Batsuit, you also are no less than five of the training available that you give each one point. In addition, you should not ignore the wanted list missions. They also bring you points. In addition, acquire additional experience points, which you earn more points in one level. The combat system of Batman games is almost iconic for the entire series. No wonder, then, that the system in Batman - Arkham Knight was taken over in large parts. The most important thing in the fight is your combo meter, which you see on the left side of the screen. The higher the combo, the faster moves Batman and more damage from additional shares. You will hit the other hand, or suppresses unnecessary on the keys, the counter is reset. So it's important to find the right rhythm and not wild hammering on the attack buttons. Tried the second beat already perform while Batman lands a hit on the first enemy. For the first time in the series you have opponent lying on the ground does not do it manually by pressing Crouch and attacking. You can daze enemies simply embed in your combo. This allows you a longer stroke consequence. Have you reached a certain height combo, which can be contacted to perform some special attacks. These include ambient attacks that in certain areas of the game (mostly confined spaces with many objects) are possible. If the Batmobile close, can also be his counterinsurgency integrate with. Then you hit an enemy when triggered in the air, where it is turned off by one of the rubber bullets. Of course, besides the combat system also is sneaking back big part of the game. As in other offshoots uses its maintenance bays, Gargoyles and destructible walls to you slink silently to unsuspecting enemies. Always uses the detective vision in such situations in order to keep track of your opponents. Be patient and wait until you can make Patrouillienwege. Opens a nonaggression, you can still escape with your grappling hook and try again after a short time. Important: also uses the smoke bomb to escape unseen. This is sorely needed, especially when enemies with firearms. New Batman: Arkham Knight is the fear multi-off. This skill combines the best stealth and combat from the series. Here you switch regardless of multiple enemies with spectacular attacks when they least expect it. Sneak on to a group of enemies until you are within reach. Then you, the anxiety-off appears. Expresses its now the appropriate button, you will turn off the first goal and then you can select with a swing of the camera the next victim. Up to three opponents can be quickly and effectively destroyed. It is important that you pay attention to the distance between the enemies. If they stand too far apart, you can not possibly reach all with an attack. So wait until you are close to each other or done it in the order in which they are away from you, so that really caught all. The Batmobile is your best weapon on the streets of Gotham. First, you often have to compete against the drones Arkham Knights. However, these are not a big challenge when you notice a few things. Remain in combat mode always on the move and targets while on the other vehicles. Their shots you see shortly beforehand on the basis of a white line. If you in this line of fire, it goes red. A clear sign for you, as soon as possible to go out of the way because the Batmobile is of course not indestructible. But also against human opponents the Batmobile is a huge relief. In the urban canyons partially propel large thugs around. This would be a challenge for you, who would also take a long time in close combat. Take instead the Batmobile to help. Shoot it on people to machine gun and rocket launchers turn into rubber bullets that make the bat after a shot unconscious. Come you the minions too close, they will be greeted by the outer shell of the Batmobile with a lightning bolt. So it turns itself from large groups of enemies in an instant. The detective finds her vision in Batman: Arkham Knight again. This will scan your crime scenes, evidence or Riddler challenges and observed the enemy that want off her. 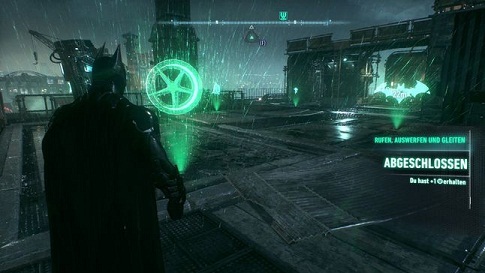 But the gadget can be used very well in the open game world of Gotham. For some side quests in the game you have to special places, hostages or find opponents. Problem in fact: You will receive no mark for that in the game world. Turns in such cases to the detective-vision and flies around a bit in the city. This you discover over long distances accumulations of opponents or special objects with which you can interact. Keep especially after destructible walls and thugs with guns out. This guard usually something very important. The game with the detective's point of view also applies to the Riddler informant. After you've done with the crazy mystery dish the first secondary task, diving his henchmen all over the city. You will know by the green glow that surrounds them. Beat all the other enemies down around them. Then you can interrogate them. So they tell you trophies, riddles, destructible objects and bomb carrier in the vicinity which you all needed for the seizure of the Riddler.